India later won their fourth PC of the match when Ramandeep’s swift run-in through the midfield towards the striking circle forced Belgian defenders to foul. A nice top of the circle variation though fetched no result as Belgians seemed well-prepared for it and denied India a goal with good defence. The final quarter saw India push their limits in their attack, created a few good chances, but couldn’t find a breakthrough ending the match with a 0-2 loss. 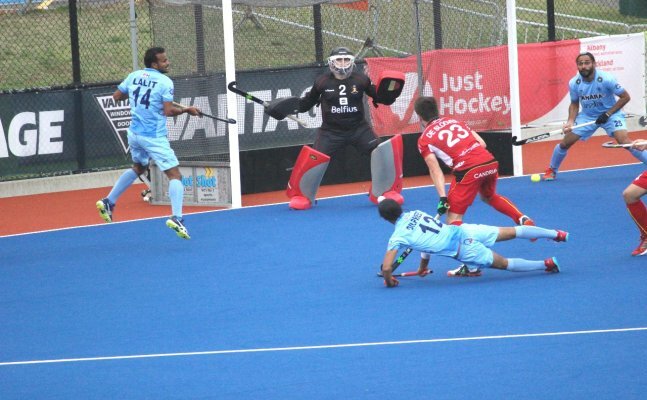 After suffering a 4-5 defeat against hosts New Zealand on the opening day, Belgium came up with a clinical performance to beat India 2-0 in the second match at the Four Nations Invitational Tournament here at the Blake Park on Thursday. Goals by Sébastien Dockier (8’) and Victor Wegnez (34’) ensured Belgium stayed on top of the game. Both teams played out an exciting first quarter, though it was Belgium who constantly tested Indian defence, moving the ball swiftly, as they created plenty of opportunities in the striking circle. Their first big attempt came in the 4th minute when Belgian forward swiftly smashed a reverse hit to the post but India’s No.1 goalkeeper PR Sreejesh, who is making a comeback from long injury haul, made an impressive save.Four minutes later, a circle penetration by Belgium saw Sébastien Dockier demonstrate a classic reverse hit to put the ball into the post leaving little chance for Sreejesh to save. The 1-0 lead in the 8th minute put India on the backfoot. In the 12th minute, however, India found a golden opportunity to equalize when forward Ramandeep Singh won the team the first PC of the match but the chance went begging, as the ball could not be stoppped at the top of the D.
A compact Belgian defence slowed down India’s attack in the second quarter. But relentless Indian forwards worked in packs as they kept up their hunt to find a successful penetration. Seven minutes into the second quarter, India’s moment to score was created by colts Armaan, Vivek Prasad and Mandeep who worked in tandem in front of the post forcing Belgian defenders to make an error. The attempt resulted in the second PC of the match for India. Unfortunately, though Harmanpreet Singh’s dragflick was defended by Belgium’s first runner. Minutes later, forward Ramandeep Singh made another foray into the Belgium circle, brimming hope of a conversion, but his nudge was high up, though Mandeep got a stick on it, the ball bounced off the cross bar. Belgium continued to lead 1-0 as the teams went into the half-time. A strong circle penetration in the opening minute of the third quarter saw India win their third PC of the match but Varun Kumar’s drag flick was deflected by Belgian defender denying India an equalizer. Only minutes later, an error by Indian defenders was capitalized by Belgian Victor Wegnez who found the gap to put the ball into India’s post taking his team’s lead to a comfortable 2-0 in the 34th minute. India, however, continued to fightback with some gritty attempts. This time it was youngster Vivek Sagar Prasad, running into the top of the Belgian D, striking the ball across to the right flank but a diving Ramandeep couldn’t quite get a touch on the ball to deflect.